Garmin’s GHP Compact Reactor 40 is an affordable solution for Marine Autopilots! Perfect for single engine outboard boats under 30’ the Compact Reactor 40 is available in 3 configurations. Simple installation and compatible with Garmin Chartplotters the compact reactor40 is NMEA2000 certified enabling heading data to easily be shared with other devices on your NMEA2000 network. Garmin created the GHP Compact Reactor 40 Hydraulic Autopilot for the single engine outboard with a compatible Garmin chartplotter which would function as the control head for the autopilot negating the need to purchase one. With its 9 Axis AHRS the GHP Compact Reactor40 Hydraulic Autopilot allows for more flexible mounting and minimizes heading error and rudder movement making for a more comfortable ride even in rolling and pitching seas, the GHP Compact Reactor Hydraulic Autopilot actually reacts to sea conditions. The Compact Reactor like with all autopilots the need for commissioning and calibration but in the GHP Compact Reactor 40 Hydraulic Autopilot it has been reduced to the absolute minimum. 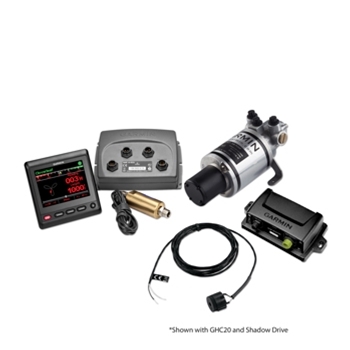 When added to a NMEA 2000 Garmin network system the GHP Compact Reactor Hydraulic Autopilot can be controlled virtually everywhere on the boat with up to 3 Garmin autopilot control heads. When used with a Garmin’s G2 Vision charts you gain optional features like Auto Guidance, which automatically steers the GPS paths. 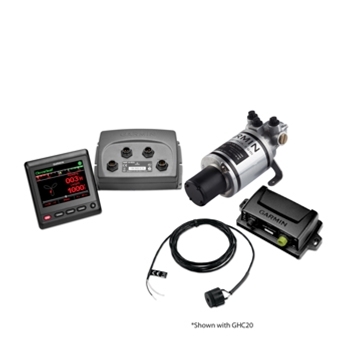 Available in 3 configurations, the GHP Compact Reactor40 can be purchased as a starter package which will include all you need to get going when paired with a compatible Garmin chartplotter. Also available with a GHC 20 which allows the autopilot to be set up without the need for a compatible Garmin Chartplotter and lastly as a complete package with the GHC20 and shadow drive which allows a simple turn of the wheel for control of the helm as well as the abililty to re-engage the autopilot by holding a consistent course. Designed to be used with one of their compatible plotters as the controller or with a GHC 20 control head, the Compact Reactor allows the skipper to sit back and relax while it maintains your course. Garmin GHP Compact Reactor 40, GA0070506, MAN# 010-00705-06: Garmin GHP Reactor CCU, 1 Liter Pump, ECU, ECU Power Cable, Interconnect Cable, Buzzer, NMEA 2000 Drop Cables (2m), NMEA 2000 Power Cable, NMEA 2000 T-Connectors, NMEA 2000 Male and Female Terminators, Documentation and a Two-Year Warranty. 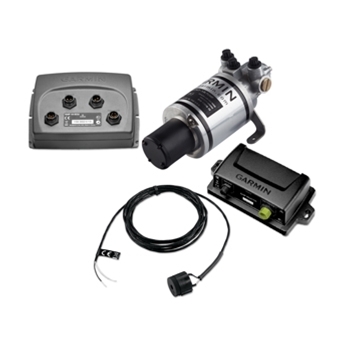 Each Garmin Compact Reactor 40 comes with:Garmin GHP Reactor40 CCU, 1 Liter Pump, ECU, ECU Power Cable, Interconnect Cable, Buzzer, NMEA 2000 Drop Cables (2m), NMEA 2000 Power Cable, NMEA 2000 T-Connectors, NMEA 2000 Male and Female Terminators, Documentation and a Two-Year Warranty. The Garmin SeaStar Fittings Kit is used for plumbing your Garmin Hydraulic Autopilot to most SeaStar Steering System. The Garmin Verado Adapter Kit is used for plumbing your Garmin Hydraulic Autopilot to your Mercury Verado Engine Steering System.